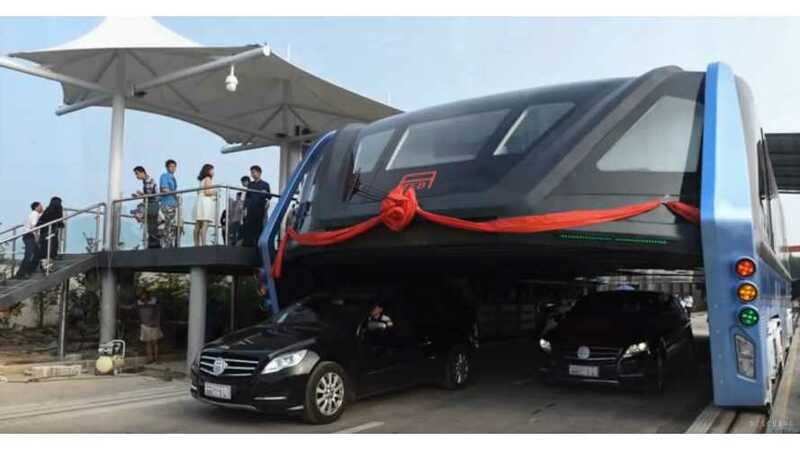 China has now reached the point where New Energy Buses eat cars ordinary electric buses are not enough. One of the propositions for the future (and heavy congestion) are a special kind of tram, called the TEB, or Transit Elevated Bus. The futuristic buses are 22 m long and 4.8 m high, and take up two lanes, but above cars. Vehicles travelling underneath need to be lower than 2 m.
We aren't sure how you feel about them, but from that demonstration video...it sure looks a bit scary to us. The top speed is just 30 mph (50 km/h), as the first prototype just completed a 0.2 mile run in Qinhuangdao. We believe that there is some storage battery component inside, but on the route the main power source will be an external connection (see video). Could this be a real thing? Apparently with proper permissions it could be.